Other than the Olympics, Elizabeth has only watched TV a handful of times. We don't put the TV on and when we have, she hasn't been interested. Until we put on Peppa Pig. She loves it! But like i said, she's only watched it a few times. So this morning when I got E dressed, I put her in a Peppa Pig t-shirt and wasn't expecting to be asked by my 21-month old if she could watch TV! She's been signing 'pig', pointing at her t-shirt and the TV. 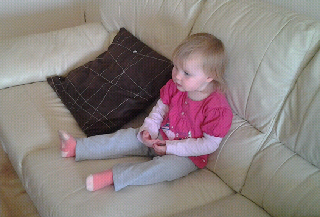 Like an obedient mother, I put on Peppa Pig. Elizabeth has never been so quiet! She's completely absorbed and asks for 'more' when the episode finishes. I expected her concentration to reach its peak after the third showing of the same episode but we're now on number 4 and I think that's plenty for a few more weeks.